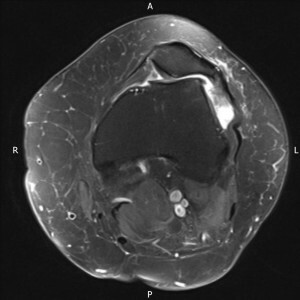 Patellofemoral joint (PFJ) arthritis involves the kneecap and groove part of the knee only. It is a form of arthritis that is commoner in females. The damage to the smooth cartilage can be due to previous trauma or fracture, previous dislocations of the kneecap, or be due to developmental abnormalities in the anatomy of the knee, where the kneecap does not glide normally in its groove. Symptoms – PFJ arthritis causes pain generally at the front of the knee commonly associated with climbing stairs or inclines, getting up from a sitting position or after a longer car journey or watching a film in the cinema ( ‘cinema syndrome’). It is often associated with crunching sounds when putting pressure on the knee – for example when squatting. Arthroscopy In the early stages, usually when no bare bone is exposed, keyhole surgery can be utilised to remove the rough surfaces , and smooth the glide of the kneecap – a technique called chondroplasty. Realignment procedures. If the patella is sitting in an abnormal position, then the patella can be realigned by either moving bony fragments (usually Fulkerson osteotomy) , or tightening soft tissues. On occasions both bony and soft tissue procedures are required. Patellofemoral replacement. 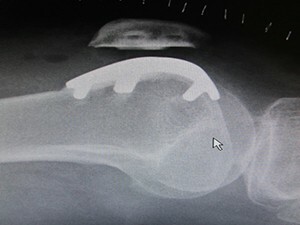 A PFJ replacement is indicated when there is constant pain, not relieved by analgesia and other non-operative methods, and bare bone exposed in only the kneecap part of the joint. 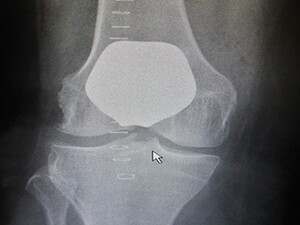 During PFJ replacement, the patella and the groove in which the patella runs are removed and replaced with usually a metal groove and a plastic button on the patella. Similar to medial knee replacements, this is a less invasive procedure than Total Knee replacement, with less cutting of the soft tissues, and usually resulting in a better range of motion and quicker recovery with reduced risks. The knee feels more normal than a total knee replacement. Mr. Flynn performs a high volume of PFJ replacements with a revision rate of approx. 0.25 compared to the national average, indicating good longevity of these implants. Ongoing pain / Progression of arthritis. Because only part of the knee is replaced, the remainder of the knee can develop arthritis over time and may need conversion to a total knee replacement. Revision surgery – if the implant loosens or the knee becomes painful, then a revision operation, usually to a primary total knee, maybe required. Length of surgery? Operation usually takes 60 – 70 minutes. When can I drive? Returning to driving requires strength to return to the leg, and will usually take around 4 weeks. What happens after the operation? After returning to the ward from the anaesthetic recovery area, the operated leg is placed on a CPM (Continuous Passive Motion) machine to move the knee and aid motion. The cryocuff will be regularly refilled with ice and inflated to reduce swelling in the knee. A patient will be mobilised often on the day of surgery or the next day. Once walking with crutches is safely established, then stairclimbing will be practised with the physiotherapy team. Crutches are used for 4- 6 weeks, but full weight bearing is allowed. Once safe to be discharged, patients can go home to continue physio exercises, and will re-attend outpatient physio every 7-14 days depending on progress to reduce swelling and improve motion and strength.